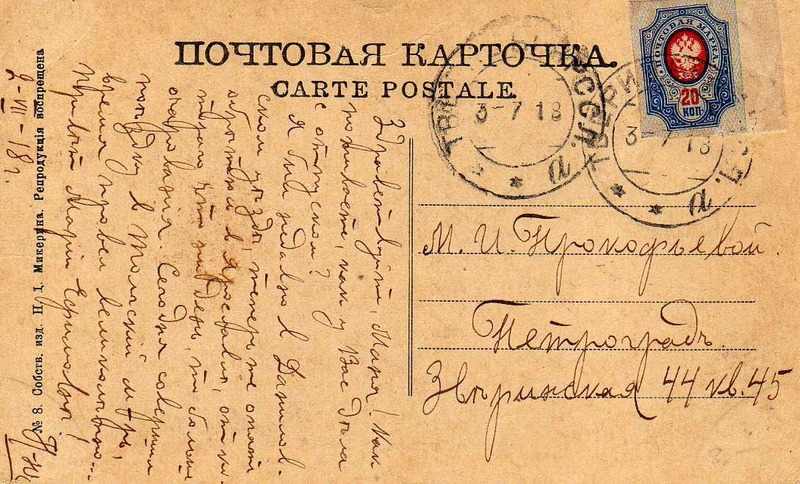 Most catalogues give the impression that Russia's imperforate Arms stamps were issued together during the life of the 1917 Provisional Government. It's possible, but their distribution and use was clearly piecemeal, bit by bit. Some places got them (probably less favoured places like Ukraine) and some didn't. I have written about this before on this Blog. 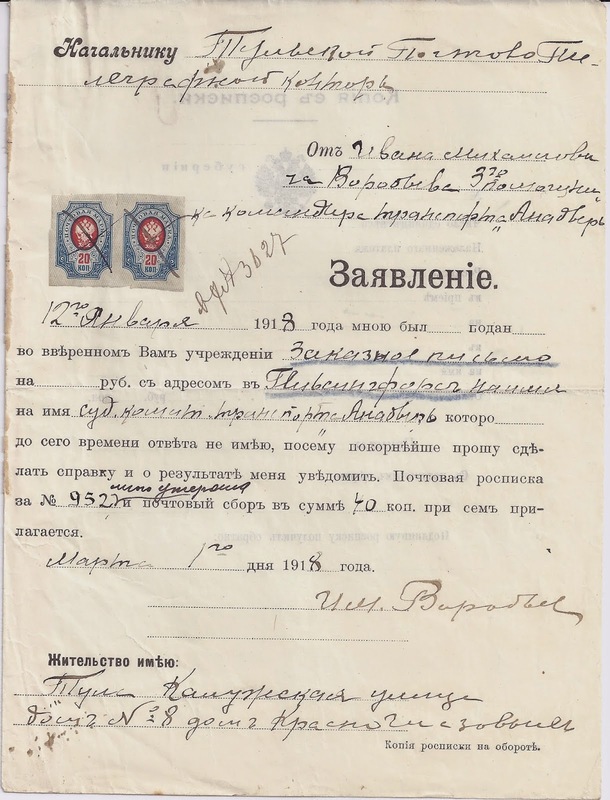 The document above is interesting because it is the earliest use I can record of 20 kopeck imperforates - at Tula, 1st March 1918 - a year after the Provisional Government came to power and four months after the Bolsheviks overthrew it.The stamps are used on an Enquiry form [ Nachforschungsanträge] regarding a missing Registered letter to Helsingfors. It's noteworthy that they were used on a form rather than for postal purposes - maybe they were used at a desk or counter whose clerk had access to a pair of scissors. From 28 February 1918 to 14 September 1918, the Tariff for sending an inland postcard was 20 kopecks. Cards franked at this Tariff are quite common, though often enough 5 kopeck Kerensky cards are used, uprated to the new Tariff. I have 31 cards in my collection franked at 20 kopecks. Not one has a 20 kopeck imperforate franking it. One has a 20 kopeck perforate; four have 20 /14 kopeck surcharged stamps; and leaving aside the uprated cards, there are 9 franked with combinations of lower value kopeck stamps: 5 use 2 x 10 kopecks; 2 use 4 x 5 kopecks; 2 use 15 + 5 kopecks. All these stamps are perforated. No sign of the 20 kopeck imperforate. Over to my readers: your job today is to show a 20 kopeck Tariff card franked with a single imperforate and / or to show a 20 kopeck imperforate used before 1st March 1918.